Finally, a chocolate indulgence that won’t go straight to your hips! Chocolatier is a resource management game that has you build a massive confectionery empire by traveling around the world, sourcing exotic ingredients, manufacturing luxurious treats, and peddling your decadent wares to a colorful cast of international characters. 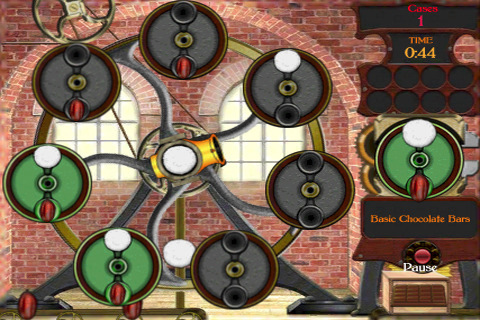 Instead of imagining some cheesy candy-themed Diner Dash game, instead, picture a surprisingly satisfying tycoon-style game with a dash of steampunk aesthetic. To be honest, Chocolatier surprised me with its overall depth and variety of gameplay. Instead of cutesy characters and repetitive, frenzied action, Chocolatier is a much more slow-paced game that relies far more heavily on a good head for numbers. Keeping track of ingredient pricing and the local chocolate markets is a key component of the game, and getting a good sense of supply and demand will serve you far better than just having a quick reaction time. You start with a single factory and recipe, and over time, you start to grow your company, breaking into new markets and learning more advanced manufacturing techniques. 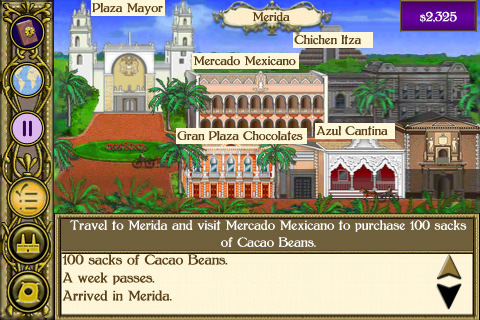 Although much of the game is dominated by traveling to new places to buy and sell goods and ingredients, there are also multiple quests and a few mini-games that help break up the business monotony. There are 64 different recipes to unlock, and while many of them you’ll simply get as you work your way through the game, it takes some real effort to get them all. Although your factories will chug away no matter where you are, every time you manufacture a new chocolate recipe, you will have to manually adjust the machinery to set the production pace. This is set through a mini-game that feels a bit like a stripped down Bubble Bobble, where you use a cannon to carefully aim ingredients at rotating disks. Waste too many ingredients and you have to start over. It’s simple enough, but recipes eventually become much more complicated and require a little more attention and dexterity. In general, I was really impressed by the overall depth and polish of the game. It looks and sounds great, and it’s definitely the kind of experience you can savor for hours on end, getting caught up in the delicious details of your chocolaty empire, but the mild difficulty level was somewhat disappointing. The lack of time pressure was nice, but there were so few risks or obstacles to overcome that each victory feels a little too easy. Still, this was a satisfyingly sweet experience overall. Although it doesn’t provide much of a challenge, the variety of play and strategy aspects made Chocolatier a much tastier and complex treat than I expected. AppSafari review of Chocolatier was written by Tracy Yonemoto on February 17th, 2011 and categorized under App Store, Games, Resource Management, Strategy, Time Management. Page viewed 10017 times, 3 so far today. Need help on using these apps? Please read the Help Page. I was wondering why this app is not available in the US? This game is the whole reason I got an iPhone to begin with, I’ve seen people play this game on the I pod and I phone but every time I try and get it on either or it says that you must have an iPhone or iPad when I try and do it with the iPod and when I do it with my 4 th generation iPhone it says that it’s not available in the US? I am very annoyed with this I just want this game! I live in Indonesia, I had this game from 2007 to 2010, but then i lost my iPad, bought iPhone4s on 2012, tried to search the game on apps store, cant find it, googled it and try to download it with the same iTunes acc, and its not available?! I loveeee this game so much and i used to play it for hours..
Can someone please tell me why I cannot download this game on itunes?! I have loved the game Chocolatier and its two sequels for several years now. I’ve been wishing and hoping for an app to download on my phone for some time now so I was ecstatic to see this until I clicked on the link provided and I was told that this app is not available in US stores yet. What can I do to get this app? I’m very disappointed. This is another review so very good! I love this blog, bro! Choco is a great app!